Marx RE, Stern D. Oral and maxillofacial pathology.Quintessence Pub. Chicago, 2003; p. 660-663. Regezi JA, Sciubba JJ. Oral pathology. 3 rd ed. WB Saunders Co. Philadelphia, 1999; p.336-339. Fonseca RJ. Oral and Maxillofacial Surgery, Vol 5. Surgical pathology. Vol. editors: Williams TP, Stewart JC, WB Saunders Co. Philadelphia, 2000; p.332-334. Philipsen HP, Reichart PA. Calcifying epithelial odontogenic tumour: Biological profile based on 181 cases from the literature. Oral Oncol. 2000 Jan;36(1):17-26. Bouckaert MM, Raubenheimer EJ, Jacobs FJ. Calcifying epithelial odontogenic tumor with intracranial extension: Report of a case and review of the literature. Oral Surg Oral Med Oral Pathol Oral Radiol Endod. 2000 Nov;90(5):656-62. Mandal S, Varma K, Khurana N, Mandal AK. Calcifying epithelial odontogenic tumor: Report of two cases. Indian J Pathol Microbiol. 2008 Jul-Sep;51(3):397-8. Belmonte-Caro R, Torres-Lagares D, Mayorga-Jimenez F, Garcia-Perla García A, Infante-Cossio P, GutierrezPerez JL. Calcifying epithelial odontogenic tumor (Pindborg tumor). Med Oral. 2002 JulOct;7(4):309-15. 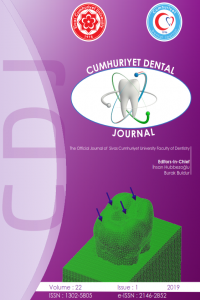 Kaplan I, Buchner A, Calderon S, Kaffe I. Radiological and clinical features of calcifying epithelial odontogenic tumour. Dentomaxillofac Radiol. 2001 Jan;30(1):22-8. Sedghizadeh PP, Wong D, Shuler CF, Linz V, Kalmar JR, Allen CM. Multifocal calcifying epithelial odontogenic tumor. Oral Surg Oral Med Oral Pathol Oral Radiol Endod. 2007 Aug;104(2):e30-4. Bridle C, Visram K, Piper K, Ali N. Maxillary calcifying epithelial odontogenic (Pindborg) tumor presenting with abnormal eye signs: Case report and literature review. Oral Surg Oral Med Oral Pathol Oral Radiol Endod. 2006 Oct;102(4):e12-5. Epub 2006 Jul 14. Deboni MC, Naclério-Homem Mda G, Pinto Junior DS, Traina AA, Cavalcanti MG Clinical, radiological and histological features of calcifying epithelial odontogenic tumor: Case report. Braz Dent J. 2006;17(2):171-4. How to cite this article: M. Selim Yavuz, M. Cemil Büyükkurt, M. Melih Ömezli, Sare Şipal. Calcifying epithelial odontogenic tumor: a case report. Cumhuriyet Dent J 2014;17( Supp 1):26-30.